One Man and A Brush painting contractor takes great pride in offering homeowners affordable interior painting & exterior painting services. We are expert painters in Suwanee GA offering only the highest quality house painting and home improvements. A competitive price is important, but we believe “True Customer Satisfaction” is realized by utilizing four important ingredients – a skilled house painting craftsman, insuring proper preparation, utilizing quality paint, and providing superior customer service. We continuously strive to provide you with a value driven competitive painting estimate, however we’ll not sacrifice quality or short cut the work simply to give you a lower price. Our Suwanee, GA painting services don’t end on the last day of your home project. We provide a free touch-up service and a 2-5 year warranty. You deserve a top quality painting contractor you’ll be proud of—that’s the only kind of work we do. Being a smaller Suwanee painting contractor allows for owner oversight, personal customer service, daily communication of your project’s progress, and including quality paint at cost, we’re able to offer you the very best painting contractor value in Suwanee GA.
We will promptly answer any questions or address any concerns you may have. We want you to be happy with the experience of doing business with One Man and A Brush Painting Contractors. One Man and A Brush House Painting also offers professional home improvement services to include seamless gutters, deck staining, rotten wood home repairs & carpentry & handyman services. Many people struggle finding a qualified house painting contractor they can trust and depend on to give them a quality product and long term customer service they can count on. Check out our credentials, view our testimonials, and call our references. 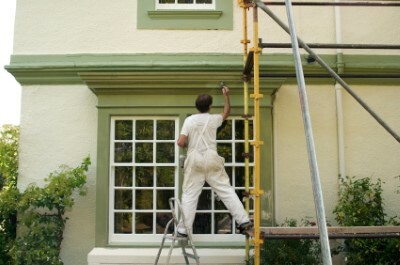 You will find that our house painting services offer the best quality, value and highest skilled house painting pros. With thousands of homes painted we have the expertise you can trust. We are professional house painters Suwanee GA that “Care”, performing quality house painting, right down to the last brush stroke! give us a try, you will be glad you did! If you are looking for a professional Suwanee painter or painting contractor in the Suwanee, GA area then please call One Man and A Brush at 678-368-5115 or complete our online request form.